One guy in the boxing ring, the black guy, is young, quick, cocky – a regular Muhammad Ali in the making. The other figure, a white guy, is the trainer, an ex-prize fighter who got close to the big time but never quite cut it. They are the shared substance and tragic sum of Brett Neveu’s devastating new play “The Opponent,” now answering its world premiere bell at A Red Orchid Theatre. An ensemble member at A Red Orchid, Brett Neveu also saw his play “Megacosm” have its world premiere there last season. He has received numerous commissions from Chicago theater companies, among them Steppenwolf, Goodman, TimeLine and Writers’. 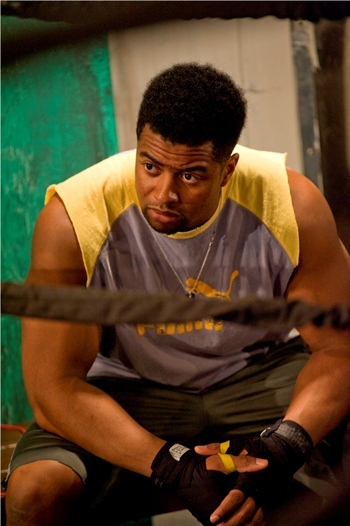 While a flurry of pitch-perfect elements contribute to make this new play an experience not to be missed, it’s those two characters circling each other in the ring – Kamal Angelo Bolden as the bright-eyed fighter and Guy Van Swearingen as his quietly bitter mentor – who compel us to believe we’re in the gym with them, watching a light heavy-weight psychological face-down. Barely breathing, we wait and wait for a hard right to land. And why wouldn’t we buy into it? Look around at this dump of a gym stuffed into A Red Orchid’s tiny performing space by designer Joey Wade, its dirty white-washed walls tattooed with tattered posters from fights long past. And at the center, the ring itself, so close you can almost touch it, smell it. The gray lighting created by Mike Durst bespeaks the sorry state of this place and its owner, the trainer who shuffles about his tasks, scrubbing the expansive blue mat on hands and knees, resigned to his oblivion beyond the lights. Fighters – a few anyway — come here to beat their chests and punch up their confidence while they skip rope, practice their footwork, hit the bag, drill the padded targets on the trainer’s uplifted hands. Kamal Angelo Bolden’s spunky young hopeful does it all, the swift rope work, the rapid-fire combinations. His sweat is real. This kid – this actor – is in fighting trim. He’s a charmer, too, quick with a disarming grin, exuding optimism. He sees himself floating like a butterfly, stinging, you might say, like Ali. Ain’t nobody gonna put a mark on his handsome face, for sure not this road dog he’ll be fighting tonight. Still, the trainer presses him to do a little more rope work, maybe put on the gloves and hit the pads, dance through the corners. Got to keep your edge. But the fighter doesn’t like the pushing. He gets testy, starts ragging on the trainer’s pathetic excuse for a fight career. The temperature rises in the gym, this room we’re all in together. You can almost hear the audience breathing. The tension drips like perspiration. Neveu’s savvy, cryptic dialogue traces the pulse of the play. The trainer doesn’t speak all that much, or very loud, but his muttering has a sharp edge, and Van Swearingen occupies that morose, smoldering persona like it was his natural habitat. The kid, on the other hand, runs his mouth constantly. The world is going to be his for the taking – the big house, the two cars, maybe three — and nothing this spiteful old has-been can say can dull that vision. Bolden is a beautiful dreamer. So much for Act I. It is almost impossible to talk about Neveu’s searing second act without disclosing too much. We rejoin the narrataive five years later. The fighter drops in at the old gym, which looks just as crappy as ever. And even though the world has changed considerably for the fighter, he’s soon back in the ring with his trainer for a tune-up. And once more, bile seeps from the older man. This time, from quite a different perspective, the fighter punches back, or at least figuratively so — at first. Then old wounds open, and leaking resentment breaks out in straight jabs. There is contact, and there is pain. Karen Kessler directs “The Opponent” with embracing empathy and eloquence, yet surely as much credit must go to fight director John Tovar for ring sequences that keep us glued to the action with equal parts of fascination and dread. And there is no saving bell.